Tags: Astronomy ( 7,546 ), Astrophysics ( 4,681 ), Basic Research ( 10,439 ), Ceres ( 10 ), Cosmology ( 4,872 ), EarthSky ( 82 ), SwRI ( 19 ), What does Ceres’ carbon mean? Earlier this month, scientists announced that dwarf planet Ceres has more carbon-rich organics than previously thought, both on and below its surface. Here’s why that’s exciting. False-color image of dwarf planet Ceres – largest body in the asteroid belt – from the Dawn spacecraft. The image shows Ceres’ famous bright spots, and the false color highlights differences in surface materials. Image via NASA PhotoJournal. Carbon is one of the most common elements in the universe and is the basis of organic biology on Earth. It can be found throughout the solar system, even in meteorites that bounce to Earth’s surface from other parts of space. Now scientists have found that another body in the solar system – the dwarf planet Ceres – is much richer in carbon that previously thought. Those results were published in a peer-reviewed article in Nature Astronomy on December 10, 2018. 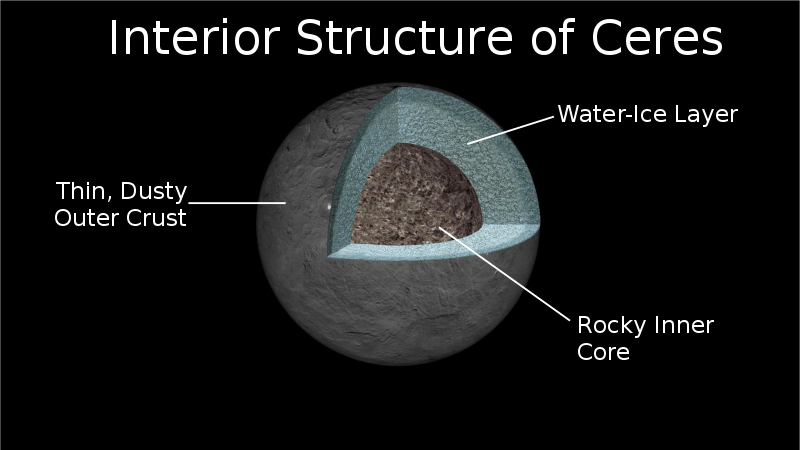 The interior structure of Ceres as scientists now understand it. Image via NASA/JPL-Caltech/UCLA/MPS/DLR/IDA. Why is the presence of carbon so intriguing? Carbon isn’t by itself necessarily the product of or connected to life, although it does serve as the basis for organic chemistry and biology on Earth. When combined with oxygen and hydrogen, carbon can form many groups of important biological compounds including sugars, alcohols and fats. Its presence on Ceres is evidence that the basic ingredients for life – including carbon – can be found in many different places, not only in our solar system but throughout the universe. More specifically, the new findings show that Ceres was, and still is, rich in amorphous carbon – a carbon-rich organic material – which is significant in terms of how carbon is distributed throughout the solar system. (Organic materials are any molecules that contain carbon – they can be formed on their own without life but are also building blocks of life). The new data suggests that Ceres contains several times more amorphous carbon on its surface and in its subsurface than even the most carbon-rich meteorites. While Ceres contains more carbon than meteorites, the study also shows that 50 to 60 percent of Ceres’ upper crust may have a composition similar to primitive carbonaceous chondrite meteorites – some of the most complex of all meteorites. 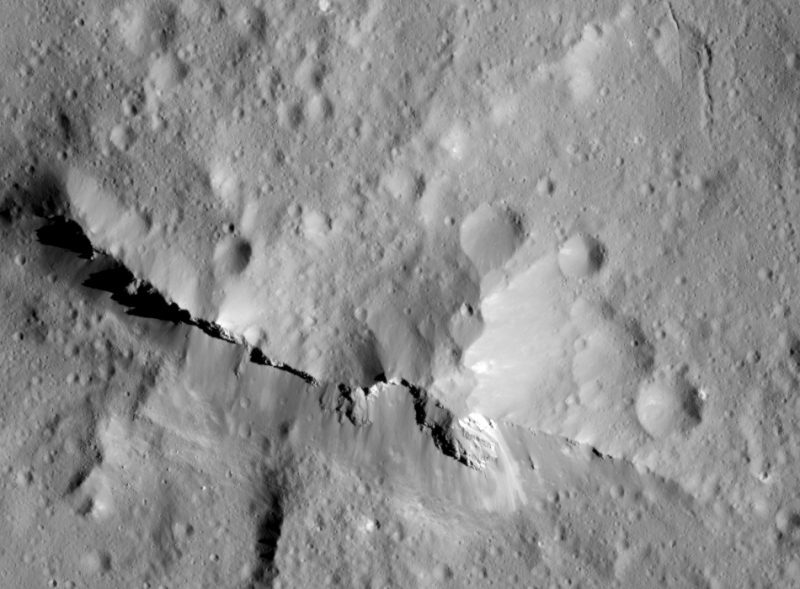 Close-up view inside Urvara crater on Ceres. The 6,500-foot (1981-meter) central ridge is made from materials uplifted from deep below the surface, which experienced rock-water chemical interactions. Image via NASA/JPL-Caltech/UCLA/MPS/DLR/IDA. In other words, the carbon on Ceres may originate from when Ceres first formed or from incoming impacts of other asteroids. Scientists don’t know yet which scenario is correct. But regardless, the evidence for chemical reactions with water is intriguing, since that can eventually lead to the formation of the building blocks of life, even if not life itself. Ceres is classified as a dwarf planet but is also the largest asteroid in the main asteroid belt between Mars and Jupiter. NASA’s Dawn spacecraft recently finished its mission at Ceres on November 1, 2018, studying its geology and sending back incredible high-resolution images of its surface from orbit. The best-known bright spots are those in Occator Crater, which stand out starkly against the darker rocky surface. High-resolution view of Cerealia Facula – a sodium carbonate (salt) deposit – in Occator Crater. Image via NASA/JPL-Caltech/UCLA/MPS/DLR/IDA/Roman Tkachenko. Whether Ceres ever had conditions suitable for life to evolve is still unknown, although there is also evidence that it has, or at least once had, water below the surface – maybe even a subsurface ocean. This water produced chemical reactions when it came in contact with minerals in rocks. There is also evidence for past cryovolcanic activity – cryovolcanoes, which erupt water, ammonia or methane rather than molten rock. It’s even possible that the subsurface environment was once warm and wet enough for basic biological chemistry to actually begin, although no direct signs of that have been discovered yet. Bottom line: As the largest object in the asteroid belt, Ceres is a fascinating world, and has been more geologically active than previously thought. The fact that Ceres is rich in organic carbon is a big part of its geological history and now scientists are beginning to understand what that means not only for the widespread presence of carbon in the solar system but also how organic chemistry can – at least sometimes – lead to the development of life itself. See the full EarthSky article here . A team led by Southwest Research Institute has concluded that the surface of dwarf planet Ceres is rich in organic matter. Data from NASA’s Dawn spacecraft indicate that Ceres’ surface may contain several times the concentration of carbon than is present in the most carbon-rich, primitive meteorites found on Earth. Ceres is believed to have originated about 4.6 billion years ago at the dawn of our solar system. Dawn data previously revealed the presence of water and other volatiles, such as ammonium derived from ammonia, and now a high concentration of carbon. This chemistry suggests Ceres formed in a cold environment, perhaps outside the orbit of Jupiter. An ensuing shakeup in the orbits of the large planets would have pushed Ceres to its current location in the main asteroid belt, between the orbits of Mars and Jupiter. Geophysical, compositional and collisional models based on Dawn data revealed that Ceres’ partially differentiated interior has been altered by fluid processes. 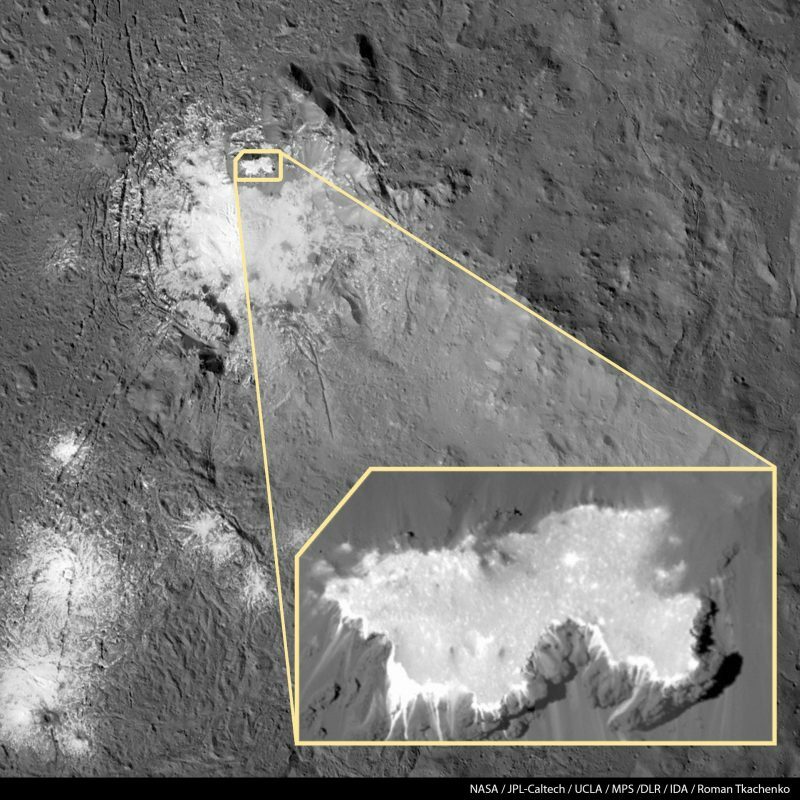 Dawn’s Visible and Infrared Mapping Spectrometer has shown that the overall low albedo of Ceres’ surface is a combination of rock-water interaction products such as phyllosilicates and carbonates and a significant amount of spectrally neutral darkening agents, such as an iron oxide called magnetite. Because Dawn’s Gamma Ray and Neutron Detector limits magnetite to only a few percent by mass, the data point to the presence of an additional darkening agent, probably amorphous carbon, a carbon-rich organic material. Interestingly, specific organic compounds have also been detected near a 31-mile-wide impact crater named Ernutet, giving further support to the widespread presence of organics in Ceres’ shallow subsurface. 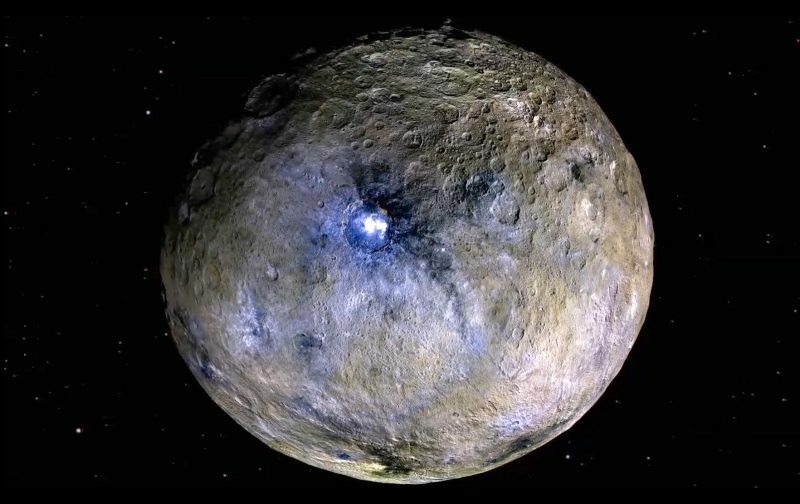 The new study also finds that 50-60 percent of Ceres’ upper crust may have a composition similar to primitive carbonaceous chondrite meteorites. This material is compatible with contamination from infalling carbonaceous asteroids, a possibility supported by Ceres’ battered surface. The paper “An aqueously altered carbon-rich Ceres” was published on December 10 in Nature Astronomy. The Dawn mission is managed by JPL for NASA’s Science Mission Directorate in Washington. Dawn is a project of the directorate’s Discovery Program, managed by NASA’s Marshall Space Flight Center in Huntsville, Alabama. JPL is responsible for overall Dawn mission science. Northrop Grumman in Dulles, Virginia, designed and built the spacecraft. The German Aerospace Center, Max Planck Institute for Solar System Research, Italian Space Agency and Italian National Astrophysical Institute are international partners on the mission team. For more information visit Planetary Science or contact Deb Schmid, (210) 522-2254, Communications Department, Southwest Research Institute, PO Drawer 28510, San Antonio, TX 78228-0510. See the full SwRI article here . Some very interesting science here, but “but also how organic chemistry can – at least sometimes – lead to the development of life itself.” is faith based speculation, not objective science. There is no viable evidence that organic chemistry ever formed sufficiently to posit that any serious biochemical compounds ever formed anything remotely complex that could be considered anything relevant to anything living.